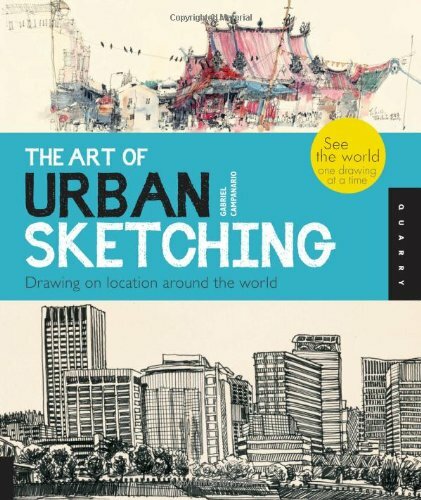 The book for the blog Urban Sketchers is finally out. I managed to get mine early at Basheer bookstore. While I was at the bookstore, I met my sketcher friends, with the books in their hands. Mine was the last copy on the shelf yesterday. The book should be in stock in February 2012. Urban sketchers is a community of sketchers who share their sketches online. There are groups in various countries. I'm a follower of the main blog. I find it very interesting to be reading about places around the world, getting to know the streets through the eyes of people living or traveling there. This book is 320 pages thick. For the price, it's a terrific bargain. There are over 500 sketches featured from artists all around the globe. The styles are incredibly varied, ranging from pencil sketches to watercolour paintings. Each artist has a personal style, and each sketch has a story to tell. Some of the artists are so good they should publish their own books. Gerard Michel is one of them. There are three sections in the book. The first is the introduction on urban sketching. The second section showcases the different places drawn. That's the bulk of the book. And the third provides inspiration on where and what you can draw. The location drawings are accompanied by artist profiles and drawing tips. I like the short stories on the sketches. Florian Afflerbach and his friends were drawing in Venice when the flood came and soak their feet. Nina Johansson documented the demolition of a public bath house, and the protest against the demolition. Artist Joao Catarino has a sentiment that I share: Drawing everywhere is like traveling all the time. Sketching is one way to get the holiday mood all the time. I can look back at my sketches and remember vividly the places visited. I cannot say the same for travel photos I've taken. The experience is richer when you're not looking but studying a place. I wish I had started sketching earlier. Your reviews are quite helpful. I'm going to buy this book!